There is a long gap until the end of April, most of which was probably a period of grieving. On 23rd January his eldest grandson Flying Officer J. Keith Turner, a RAF navigator/observer in a Wellingtom XIII of 69 Squadron, failed to return from the final reconnaisance mission of their tour, over German held territory in Holland, and was later confirmed killed. 69 Squadron was part of the 2nd Tactical Air Force supplying low level night-time photographic and visual reconnaisance intelligence of the front line for the troops on the ground. 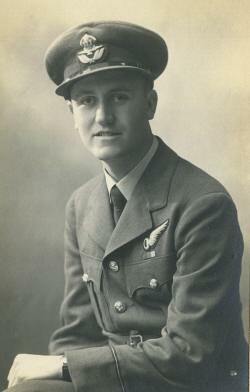 A site dedicated to another member of that crew, Flying Officer John W. Lowrie, has an account of that final operation. At 1.45pm an 'Alert' was sounded and all schoolchildren were sent to the shelters. The 'All clear' went at 2.00pm. Apparently two unidentified planes flying very high were seen approaching the coast. This was the last alert of the war. Today the sirens have finished although the blackout still exists. I believe our first 'Alert' was sounded very early in the morning the day after war broke was declared and I went out in my dressing gown and had an argument with two unknown men. London rightly and proudly boasts she had 1200 alerts. It seems a lot. We also had several. 2040. So Wailing Willie's gone to sea, we are glad that he is dead, but he stood the test and broke our rest, while we laid in our bed. Blackout lifted on the coast at midnight tonight. FINIS. An official account of the War Damage to Lowestoft was given by the Mayor at the Odeon on 6th May 1945 to the Regional Commissioner Sir William Spens. The first 'Siren' sounded just after 11.00am on Sunday 3rd September 1939 and the last was at 1.35pm on 30th April 1945. The first 'Cuckoo' - instant danger - was at 9.37am on 20th March 1942 and the last at 9.15pm on 22nd March 1945. The total number of 'Sirens' was 2047 and the total 'Cuckoo' was 628. High explosive bombs within the Borough boundary totalled 826 of which 113 were unexploded, 3 flying bombs fell and 6 parachute mines, killing 272 and injuring 713 (members of the services are not included in those figures). For the size of the population the 70 fatal casualties from one stick of bombs dropped on the main shopping centre (on 13th January 1942) was probably the greatest disaster. Approximately 5000 incendiaries fell in the Borough and another 7000 around were probably meant for the town. Successful bombing attacks numbered 105 but those meant for the town and which fell just outside numbered a further 178. Another record was on 19th October 1942 when the 'Siren' sounded 30 times and in addition there were 20 'Cuckoos'. The last manned bombing raid was on 20th April 1944. In one month there were 27 attacks on the town. There was great praise for the fortitude of the people of Lowestoft from both Sir William Spens and Lord Cranworth. Editor's note: Sir William Spens was the Regional Commissioner for Civil Defence for the Eastern Region. Lord Cranworth was the Honorary Colonel of the 358th (Suffolk) Medium Regiment.